I also listed Tom Bernhard as unlikely to lower the Men's 65-69 record he set last year of 17:31. He got off to a slow start with his training this year due to a knee (meniscus) issue which was solved with surgery and international travel shortly thereafter. I indicated that a record from Sabra Harvey for Women 65-69 was possible. Harvey has had several record runs in the last year or so but this would be tough; a subb-20 minute effort would be needed. That was not necessarily out of reach but then Hurricane Harvey hit Houston and Harvey's training in the run up to the race was interrupted, to say the least. I guess the headline would be: HARVEY SLOWS HARVEY! Luckily she is well but there is a lot of cleanup to take care of and lots of time devoted to insurance adjusters. She would need to beat Kathy Martin's 19:57, set on this course last year. Jan Holmquist is the current holder of the American 5K record for Women 70-74 at 22:14, set on this course in 2015. Unfortunately a good chunk of 2016 was lost to injury and although she has made terrific strides this year, and especially over the summer, I thought it a stretch too far for her to lower her own record and listed it as unlikely. Neither the possible nor the two unlikely records happened, although the athletes ran tremendous races, won their age groups and had age grading scores at or near the top of the field. Tom Bernhard clocked 17:55, Sabra Harvey finished in 20:44, and Jan Holmquist registered a 22:27. They all overcame some setbacks to get there and no one will bet against them lowering those marks next year. Kevin Castille. 45. In July, Castille lowered the American Men's 45-49 15K record from 48:00 to 46:11 at the Utica Boilermaker-wow! And the old record was held by a pretty fair runner in his day, Bill Rodgers, who set it on the same course 22 years earlier. 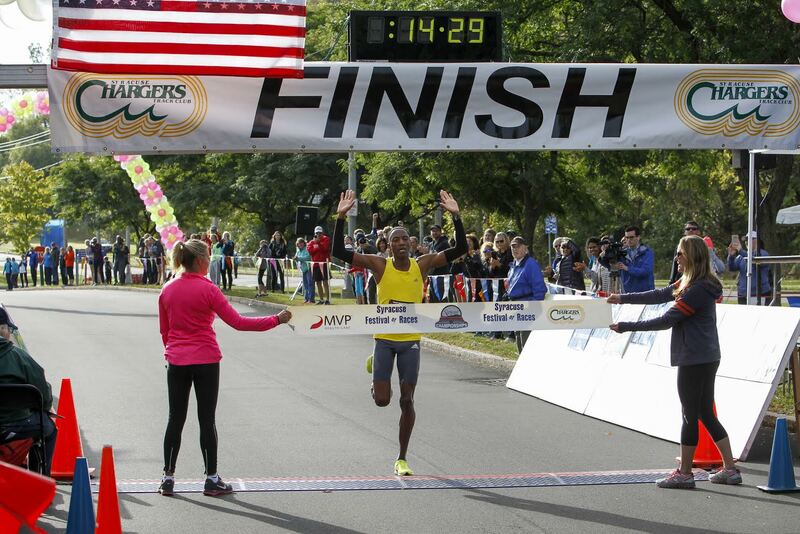 In late August Castille knocked off another Rodgers record at the Crim 10 Miler in Flint MI. He lowered it from 52:22 to 49:03. Presumably it is only a matter of time before Castille drops the hammer on Rodgers's American record in the Half Marathon. This is, arguably, Castille's finest event, ad probably his favorite. In the meantime, what about the 5K record? Castille knew what he had to do and left no doubt. He crossed the 2.5K mat in 7:11, giving himself about 11 seconds to play with. As it turned out he ran the second half at better than record pace too. He clocked 7:18 for the second half, winding up with a new American record time of 14:29! 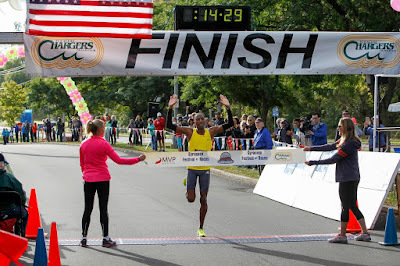 At the same time, Castille will also top Ken Stone's list of World Best Performances [http://www.arrs.net/Veterans/VR4_R5K.htm], beating Wilson Waigwa's former #1 time by 2 seconds. Waigwa, from Kenya, set the record in October 1994 in Providence RI. Castille is having an amazing year! New American Men's 45-49 5K Record--Kevin Castille, Lafayette, Louisiana 14:29. Nat Larson. 55 The thing that made this record attempt odd is that Larson could beat the posted American record and yet not wind up with a new American record at the end of the day. Larson smashed the posted record of 16:07 by 13 seconds at the CVS Downtown 5K in Providence RI on September 15th. So even if he beat the posted record, he might not lower his own, new record time. 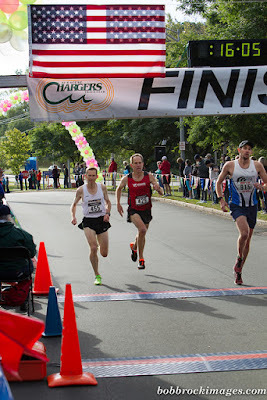 Dave Oja, Race Director at the SFoR, offered the observation that, on average, over a dozen years or so, elite runners like Larson, would typically run 8-10 seconds faster in Syracuse in years when they ran both events. Of course, on average, is not a guarantee just an indicator. Wat transpired> Larson knew he would likely need to hit the halfway mark in well under 8:00 to have a good shot at his new record. He was in a second chase pack overall that crossed the mat in 7:59. Unless he had been holding a lot in reserve, that probably did not bode well. In fact Larson was not able to overtake his own record, clocking 8:07 for the second half. That allowed him to break the posted American record, no mean accomplishment! Larson offered the view that in Providence it had been relatively easy to just tuck in with a couple of Open runners and not worry about much of anything. He was probably more relaxed there. 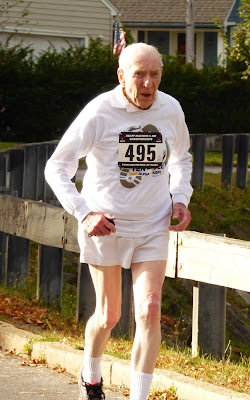 The pressure of trying for a record and competing with 5-7 of the 50's guys in the Masters Championship may have made for less relaxed running and therefore somewhat slower running--although using the word, 'slow' anywhere near a 16:06 5K at age 55 is quite a misnomer. 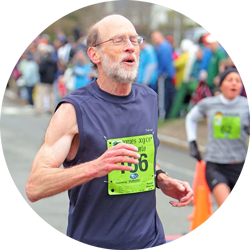 According to Ken Stone's website, the only man who has run a faster 5K is Martin Rees of Wales, who ran 15:31 and 15:38 in 2008. Anny Stockman. The current record listed is 43:00 by Ruth Rothfarb at the 1989 edition of the Freihofer’s 5K for Women. Earlier this year, in June, before her 85th birthday, Stockman ran 40:50 at Freihofer's. So Stockman had a margin of error of over 2 minutes. Stockman set a good pace right from the start, crossing the halfway mat in just under 20 minutes and saved enough that she ran a negative split, crossing the line with over 3 minutes to spare in 39:41! Congratulations to these outstanding runners as they write their names into the record books by training hard and performing on the race course!